Over 50 Years in Whitehorse! Under the sponsorship of the Alaska District, Rev. Trueman Shelton came from Sitka, Alaska to Whitehorse in 1958 to open the work of the Church of the Nazarene. The first meeting place was a rented building, down by the Edgewater Hotel. In 1959, a two story military building was purchased from the Salvation Army on the corner of 4th and Jarvis. Also in 1959, Dr. R.G. Fitz, former missionary to China and Alaska came and served in Whitehorse for six months. During that time it is said he called on every home in Whitehorse and turned up only three people with any interest in the work. Rev. Aubrey Ponce followed Dr. Fitz and pastored here for three years. He and his family lived in the building and held services in their large living room. Rev. Ponce built a good Sunday School. It was very difficult, however, to reach adults, especially with the services being held in a home rather than a separate chapel. The Ponces were forced to leave by ill health. Curt Hawkins filled in for a few months and then the church was without a pastor for a period of time. In 1962 Rev. and Mrs. Russell Hart came and it was during their time, on March 6, 1963 that the church was officially organized. Rev. Hart saw the need of a regular chapel and began to look for possible solutions. He was able to purchase a military hall from Crown Assets for $2,500. This he cut in half, adding half to the back (south side) of the existing building and selling the other half for $2,500. During this time, up to 85 people would attend church in the front room. Russ, who is both a carpenter and an artist, finished the inside with a lovely combination of painted wallboard and light oak paneling. It was completed in 1965 and dedicated on February 27, 1966. About this time the military installations in Whitehorse ceased operation and soon were completely vacated. This was a real blow to the economy of the little city and affected the entire town in general. Rev. Hart accepted a call to Washington in 1966. The Rev. Paul Chavet family came shortly after and were here about two and a half years. 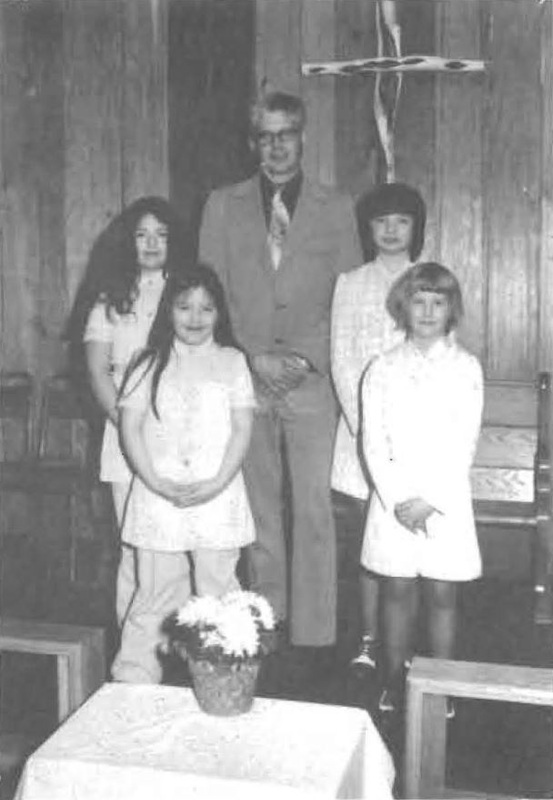 In June 1969 Gene & Merrilee Morrell, along with their five children, arrived in Whitehorse. It was a balmy 98 degrees on the day of their arrival. Forest fires were threatening the suburbs. Soon the mother of two Sunday School children had to evacuate their home and stay in the church. Gene writes: “We noticed immediately that there was no sign on the building or property to identify it as a church, and the weeds were three feet tall all around the building. It looked deserted. So our first job was to cut the weeds and paint and hang a sign. A total of 12 people attended our first service, which consisted of my family of seven and the former pastor’s family of five. I was introduced to two families whose children sometimes attended. The former pastor moved on, and the next Sunday we had our family and two children for a total of nine.” There were no scheduled services and virtually no congregation save about half a dozen Sunday School children. The membership roll showed 12 members, two of whom were the former pastor and his wife. Others were members who moved away or were not attending. Most of the calling in those days was done at a nearby coffee shop. As contacts were made Pastor Morrell was able to extend his calling to homes. The congregation began to grow and gradually they outgrew the three small classrooms that they had. Classes began to spread into their living quarters, but they still had no room for activities or fellowship. This was a great burden and as they prayed it seemed that they were only facing closed doors. Then God, through a member, Mr. Art Mason, opened up a perfect opportunity to build a house, thus leaving all the downtown facilities available for church use. In October of 1971 the Morrells moved into the new home. Now the area formerly used for living room and dining had to be remodeled again, this time into a recreation room. Next the exterior of the church was remodeled and long stained-glass windows were installed in place of the large military type windows. The platform area of the sanctuary was covered with knotty cedar and finished off with a beautiful diamond willow cross. Gene writes: "With the help of Rev. Gibson from Anchorage, we did a financial program and raised $13,000 towards the purchase of new property". 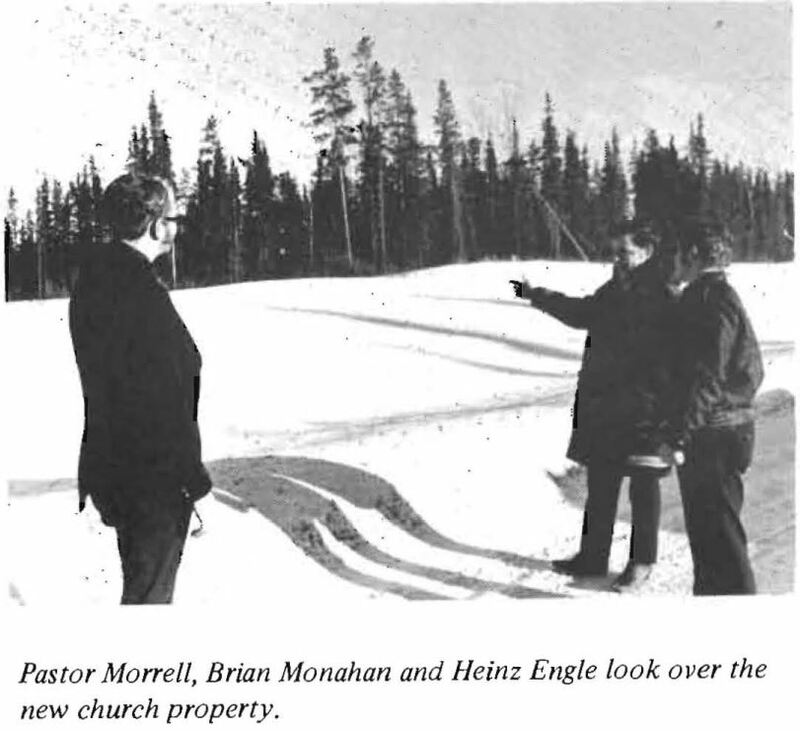 In 1974 two acres of property were purchased along the Alaska Highway for a sum of $20,000. A building permit was secured in 1976 to begin construction of the new sanctuary, designed by Mr. Rob Mason, to accommodate about 150 people. In 1977 the original property was sold for $71,000 which then facilitated the construction of the new building. Once again Mr. Art Mason was a great help as Art was a builder and a valuable adviser to the pastor in the sale and relocation. He oversaw the entire building project. Arts brother, Rob Mason had drawn the original plans for the building, and Bob Kroeker finished the plans and obtained the blueprints. John Ingalls, Art Mason, Bob Kroeker, and Gene Morrell all worked on the construction. Al and Dedee VanderStoep, who had helped prepare the old building for sale, now came and stayed three months and helped daily on the new building project. Several local pastors also helped at various times, from as far away as Ross River. During construction, the church worshiped in a school for a year until the basement was completed at the new location. When the basement was completed it was used for worship services. At the end of the very first Sunday in the basement, a Bible reading program was started in which the Bible was read in the basement, from Genesis to Revelation, 24 hours a day, until completion – 77 ½ hours. The next year the main floor was finished. The outside walls were raised all in one piece, with a great deal of help. A carpenter friend of Pastor Morrell’s came from California. And John Ingalls, an RCMP officer, enlisted the assistance of half the police force, and many from the local congregation were also helping. Kenny Wright, a layman from Totem Park Nazarene in Fairbanks, sold the windows at cost and then came and installed them. He made them, and they were the first triple-pane windows in Whitehorse. The building was completed and furnished at a total cost of $98,000. It was dedicated by Dr. George Coulter on October 8, 1978. On the day of dedication, former pastor Russell Hart was invited, and just when he came in through the doors, the entire ceiling in the pastor’s office collapsed onto the floor. Because Pastor Gene was on his way out the door to pick up General Superintended, Dr. Coulter, Russell Hart quickly re-installed the ceiling where it belonged! In 1980 Rev. and Mrs. Darby came to the Yukon and served until 1983. Larry Darby writes, "For 3 weeks in a row a young man would come into the sanctuary after Sunday service had started & he would get out while I was giving the benediction. On the 4th Sunday I vowed that he was not getting out without talking with me. So, while I was still preaching I wandered to the rear of the sanctuary & blocked the exit while giving the benediction. He is now a preacher in the Church of the Nazarene. The Lord blesses in unusual ways." Also in 1980 the church began the operation of a Daycare Ministry. A few months later, Sheila Brown was hired to serve as director. She stayed in that position until October 2000. We consider ourselves blessed to have had her lead this ministry for 20 years. Robert Kroeker writes, "Around about 1980 or 81 Rev. Charlie Ah Sing, a Point Loma graduate and former classmate of Rev. Darby came to serve as Youth Pastor. For his trouble, he received a very small cash allowance, free room and board in our home, and the use of the church van. For about a year he gave himself to ministry to the youth and children of the church. Teens from the church families, Art, Evelyn, and Leonard Squire, Wayne, Bill, Dean, and Tara Mason, Shelley, and Cynthia Brown and others enjoyed the benefits of his ministry while he expanded that ministry to include families new to the church, the Walkers, Cornells, Fleurys and others." 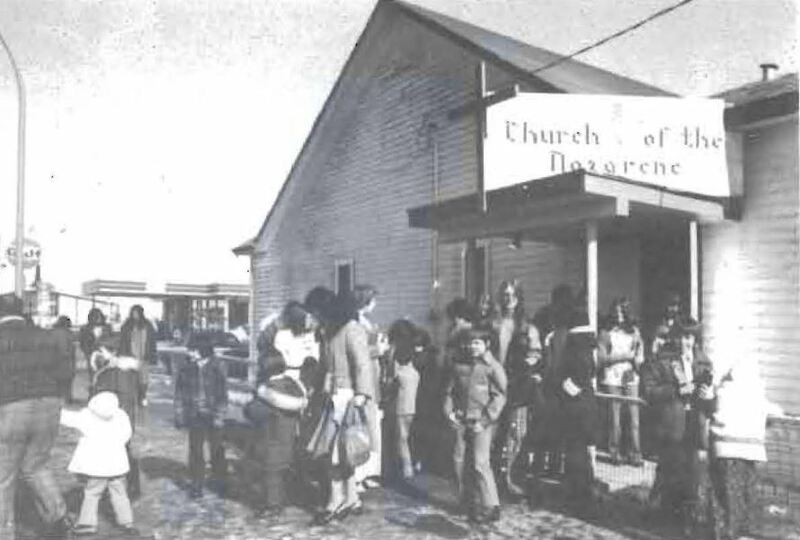 In 1983 the Whitehorse Church of the Nazarene became a part of the Canada Pacific District. Until that time the church was part of the Alaska District. In 1986 Pastor Norayr (Norman) Hajian and his wife, Heather came to fill in for the summer in order to give the district superintendent, Rev. Charles Muxworthy, some time to find a suitable candidate to serve as pastor. Towards the end of the summer, Rev. Muxworthy, after consulting with the church, asked if the Hajian’s would return to Whitehorse in 1987 (after he completed his studies at seminary). Over the winter of 1986/87, Rev. Titterington came to serve as interim pastor. In 1987, Norman & Heather Hajian returned to Whitehorse and soon had the first of four children in Whitehorse. By 1987, the daycare had grown from a small, one-room operation, into a large daycare needing much space. The biggest challenge was the entry way, which was much too small to serve as a boot room for all the daycare children. 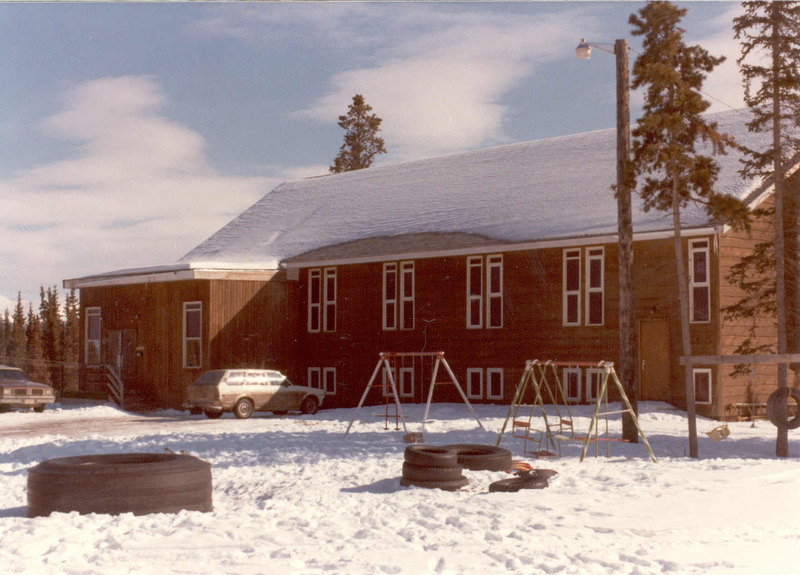 Over the winter of 1987/88 a grant was secured which enable the church to build the north wing extension to serve as a church foyer, daycare office, daycare coat room, and washrooms. Before construction began, plans were changed and a basement was added to the project. This basement would be finished at a later date and would serve as a Sunday School area. The addition was completed over the winter, spring and summer and was dedicated on August 14, 1988. This provided ample room for the children for an entry way, as well as a new space for the daycare children away from the rest of the daycare. The following winter, as the daycare continued to expand, another project was undertaken on the opposite side of the property. Again a grant was secured and again a basement was added to the plans The south wing would be used for the expansion of the daycare nursery. The basement, originally built as a fellowship hall, was eventually used for the growing after-school program of the daycare. After nearly 20 years of service, in the fall of 2000 Sheila Brown announced her retirement. Over the years she had seen the daycare grow from a tiny one room operation into a daycare licensed for 104 children. She was a great friend to many of the daycare families and a strong supporter of the church in all of it’s activities. In an effort to further emphasize the Christian ministry of the daycare, in June 2002, the church hired Clayton Keats to serve as Associate Pastor responsible for our daycare ministry. His education in both biblical studies and child care proved to be the combination we needed. He was ordained in June 2005 and continues to serve as worship leader and daycare director. Also in 2002, Megan Polowski came to the Yukon, to work in the daycare for a summer. After spending her summer here in 2002 and 2003, she returned in 2004 after completing her education. She soon started a youth group, received her district ministers license and was ordained in June 2011. She served as youth pastor in Whitehorse until Oct. 2011 having led the youth in hundreds of events and several trips, including trips to Mexico and Poland. 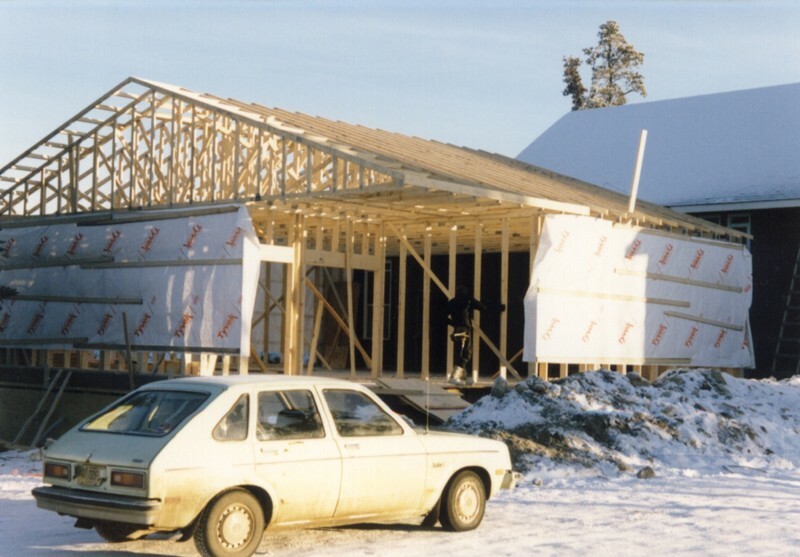 In June 2004, a Work & Witness team, led by a group from Abbotsford, came to Whitehorse to do some much needed work in the basement of the first addition. They rearranged some walls, put in a concrete staircase outside, and completely redid the connecting hall between the main building and the addition. They made the building much more functional, safer, and energy efficient. Many people from the community pitched in and helped, including an electrician who donated his time and a drywall finisher who also donated his time. By 2007 the asphalt shingles on the original roof were well past their life expectancy. This would be a major project, as the roof is both large and steep. John Ingalls, former member, responded to the need (driving up from Manitoba) and personally undertook the project of replacing the shingles. This was no small task, but was accomplished quickly and safely - to everyone's pleasure. In the fall of 2009, under the leadership of John Kooy (from Alberta), a major renovation was undertaken in our parking lot. The entire parking lot was professionally excavated and graded and a concrete pad of 350 square meters (3780 square feet) was poured. In the process, 33 truck loads of gravel was used to prepare the parking lot. Once again, many people from the church came out to help, tying rebar, pounding stakes, setting forms, and finishing the concrete. Also in 2009, in consideration of the elderly people who had difficulty entering the sanctuary, the church undertook the installation of an elevator style lift at a cost of $40,000. The renovations necessary (to accommodate the lift) and the construction of the area was contributed by Myron Penner. In 2010, the church was looking to stretch it's reach into the communities. 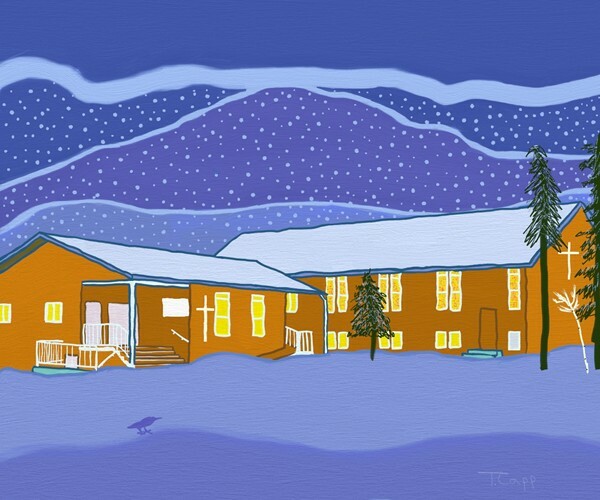 With an eye on the community of Tagish, the church began to pray. 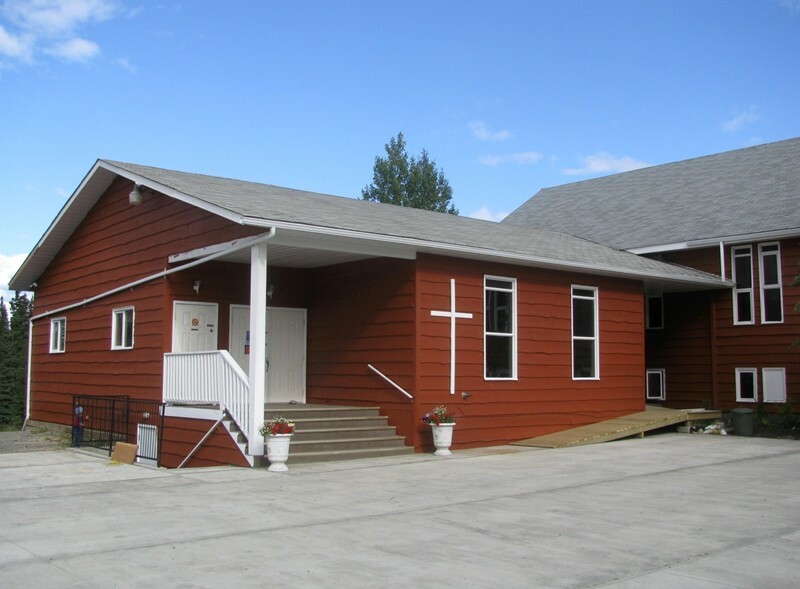 In May 2010 the first service was held in Tagish in the home of Myron & Shelley Penner. Services were originally held once a month, but have since (in 2012) moved to twice a month and are now held at the community hall. Back in Whitehorse, with the building getting older, and in preparation for the church's 50th anniversary, the call went out for a Work & Witness team to come and help us re-stain our building. Much of the building was well overdue in needing a fresh coat of stain. After nearly two years of waiting and searching, the Juneau Church of the Nazarene (Alaska) answered the call and sent a team in 2012 to undertake this project. With piles of scaffolding and many gallons of stain (most of which actually did end up on the building) the project was completed in a week; giving the church a fresh new look. Heather Keats had been serving as Director of Children's Ministries, but with a heart for ministry, and pursuing ordination, in 2014 we recognized her call to ministry and appointed her as our Children's Pastor. She continues to lead us in our many children's programs. In the spring of 2015, an energetic group of Filipino people were outgrowing the home in which they were meeting for weekly worship. Their pastor, Merlyn Maningas, met with Pastor Norman and the church board, and soon this group was formally adopted and received as a ministry of the Church of the Nazarene. They have since been meeting weekly on Sunday afternoons at the church. The church continues to serve the community in many ways; most notably a ministry to children in our daycare. We also have a free clothing room, open twice a month to the public, as well as free computer repairs. We have a vibrant youth group, led by Sarkis Hajian. We have a monthly ladies Bible Study. We have weekly Bible Studies on Wednesday nights and Sunday mornings. We have special annual children's programs. But most precious of all, we grateful for the presence of the Lord each time we gather together. We are here to serve the Lord by serving our community. Over the years, we have seen many people attend the Church of the Nazarene and many lives have been touched by the grace of God. We look forward to all that God has in store for us in the years ahead. 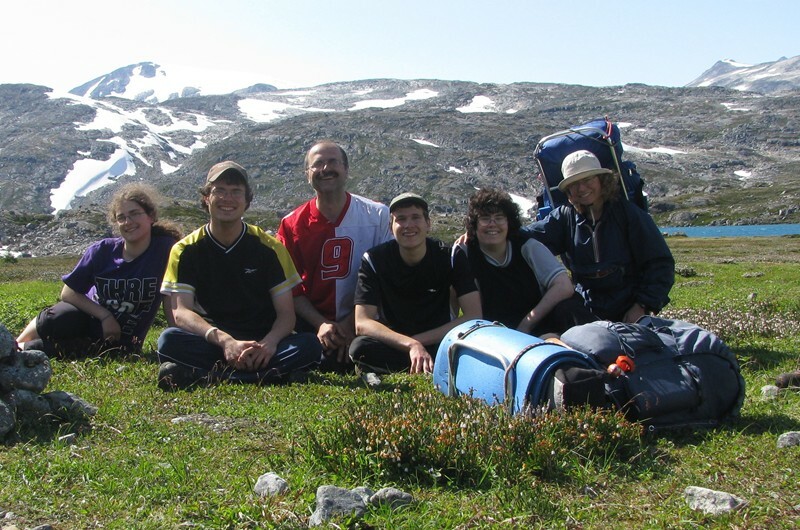 Pastor Norman and family on one of their family hikes over the Chilkoot Trail. Look Back on our 50 year Anniversary; April 27 & 28. To see some recent pictures of the building, click here.